The Republicans’ last-ditch effort to demolish the Affordable Care Act is so abominable it makes previous attempts look practically benign by comparison. Convert funding for Medicaid, a program that covers over 70 million Americans, from an open-ended entitlement to a block grant to states. Allow states to impose work requirements for Medicaid recipients. Eliminate the subsidies that make insurance and health care services affordable for low-income individuals. Allow states to waive coverage of essential health benefits, such as mental health care, prescription drug coverage, and maternity care. Allow states to end protections for pre-existing conditions. Insurance companies would be free to charge different rates to healthy and sick people. Eliminate lifetime caps on coverage. End the employer and individual mandates, retroactive to 2016. The Graham-Cassidy bill would take all the federal money that currently funds insurance subsidies and the Medicaid expansion under the ACA and dole it out to states according to a complex formula, redistributing it in a way that the bill’s sponsors claim is more fair. However, it would shift money from states that expanded Medicaid to those that didn’t. California, for instance, would get $27.8 billion less in federal funding in 2026, while Texas, a non-expansion state, would get $8.2 billion more. States would have to spend these funds on health-related costs, but not necessarily to help lower-income people purchase insurance. There would be less money available overall; funding would be 34% lower by 2026 than under current ACA rules, according to the Center on Budget and Policy Priorities. All of the grants would end in 2027, putting health insurance for millions in grave jeopardy, unless Congress decided to appropriate more money. Converting Medicaid disbursement from the system now in place to a block grant to states would be a monumental shift. Under current rules, Medicaid is an open-ended entitlement, meaning that funding expands if more people become eligible. This is crucial during economic downturns or in public health emergencies. If federal funding for Medicaid is capped and inflexible, then states would be forced to make up any budget shortfall. This could result in cost-cutting measures, such as limiting eligibility or reducing benefits. Earlier this summer, the Congressional Budget Office estimated that a straight repeal of the Affordable Care Act would result in an additional 32 million uninsured by 2026. If Graham-Cassidy passes, the final toll could be even higher, due to the harshness of the Medicaid cuts. Those who do maintain coverage could face sky-high premiums and deductibles for plans that cover very little. Graham-Cassidy might be the fulfillment of a longstanding Republican pledge to repeal Obamacare, but it would cause untold pain and suffering for millions of vulnerable Americans. The Senate’s latest version of its atrocious health care bill, introduced last Thursday, retains nearly all of the damaging provisions from the previous draft while adding some new ones to make it even worse. The Better Care Reconciliation Act keeps the draconian cuts to Medicaid and the drastically reduced subsidies for people to purchase individual plans on the state exchanges. It expands the use of tax-advantaged health savings accounts to pay for insurance premiums, which mainly benefits those with higher incomes. The most notable—and potentially damaging—addition to the new bill is Ted Cruz’s “Consumer Freedom” amendment, which would allow insurance companies to sell bare-bones policies on a state exchange as long as they also offered at least one Affordable Care Act-compliant plan. These minimal policies would likely feature skimpy coverage, low premiums, and high deductibles; those who actually needed health care would be forced to buy comprehensive plans, the costs of which would then skyrocket. It would amount to a return to the pre-ACA days when insurance companies could deny coverage to those with pre-existing conditions or make it prohibitively expensive. The result would be a two-tiered risk pool in which the younger and healthier could purchase cheaper policies that effectively cover nothing, while those with greater health care needs—chronic conditions, mental health requirements, age-related demands—would face unaffordable premiums, causing enrollment to drop and premiums to spike even higher. For Republicans and others on the political spectrum who espouse a free market approach to health care as the ultimate way to cut costs and expand choice, this is essentially what it would look like. It’s worth noting that in addition to the American Medical Association, American Hospital Association, AARP, American Cancer Society and dozens of consumer advocacy organizations, the trade group for the nation’s insurance industry has come out against the bill. Insurance is supposed to protect against unforeseen costs: an auto accident, tornado damage to one’s home, the theft of one’s belongings on vacation. If we could anticipate all of our expenditures, we wouldn’t need insurance. The objective of health insurance has expanded from its original purpose of income stabilization to include the administration of health care with the aim of maintaining or increasing wellness. As studies have shown, personal bankruptcies and medical debt are down since the passage of the ACA, and Americans appear to be healthier. The Senate bill does not address either of these goals, and in fact would detract from both. Because the Republican Party lacks a coherent vision of what a workable health insurance system should look like, or even if it’s the government’s role to provide health care for any of its citizens in the first place, they have given us a mess of a bill that would decrease coverage by millions while doing nothing to keep health care costs down. It’s a world in which anyone who is poor, sick, or old will have the freedom to replace their health care with no health care at all. Last Friday, House Speaker Paul Ryan withdrew his health care bill from consideration after it became clear that he had failed to amass the support necessary to get it passed. It was a victory for Democrats, for the 14 million people who stood to lose their health insurance next year if the bill had gone through, for the hospitals and community health centers that would have lost revenue when their patient base dwindled or was less able to pay for care, and for the countless Americans who depend on mental health coverage, drug treatment, maternity care, preventive services, and other essential health benefits mandated by the Affordable Care Act. It was a major defeat for Ryan, for Trump, and for the Republican Party, which now faces a tougher battle to enact the rest of its agenda. In particular, the massive, permanent tax cuts for the rich that Ryan has been eager to pass now look less likely. The reasons why have to do with the nitty-gritty of the legislative process, but my understanding is that it goes something like this: in order to get around a potential Democratic filibuster, any GOP tax bill would have to be revenue-neutral after ten years, meaning that it could not increase the federal deficit after that point. The GOP needed to repeal the ACA and its $1.2 trillion of taxes on higher-income earners first to reduce the baseline of tax revenue. This would then have allowed them to design a tax code that could bring in $1.2 trillion less and still be revenue-neutral. (Jonathan Chait at New York Magazine has a more detailed explanation here.) But since the ACA repeal failed, the Republicans will have to rethink their strategy on tax cuts and what’s politically viable right now. The larger takeaways from the downfall of the GOP’s American Health Care Act have to do with what it reveals about the current political moment and what comes next. 1. The Republican failure to repeal Obamacare indicates a federal right to health care that now cannot be taken away. A number of commentators and lawmakers have said this, including Chait (again) in a column last Friday, Jonathan Cohn in the Huffington Post, and Senator Bill Cassidy (R-LA) in an article in the New York Times. I hope they’re right, but I’m more cautious. The AHCA died not because moderate Republicans decried the bill’s cruelty in stripping away health insurance from their constituents. Rather, it was defeated by a coalition of Republicans with a range of political convictions. According to an analysis in the New York Times, nearly as many ultra-conservatives (15) were against the bill as moderates (10) and “others” (8) combined. The hard-liners thought the legislation didn’t go far enough in ending the ACA and its protections, among them Medicaid and the law’s essential health benefits. In short, there was no ideological consensus among the Republicans who were opposed to the bill. 2. The AHCA revealed the GOP’s true aims: tax cuts for the wealthy and cuts in benefits to low-income Americans. As I’ve written previously, the bill was stunning in its barefaced cruelty, gutting Medicaid and reducing income-based subsidies to pay for health insurance, while pushing through enormous tax cuts for rich people. 3. Politics, not policy, dictated the process. As the last-minute deal-making revealed, there is no GOP agreement on the federal government’s role in providing health care to its citizens, or even whether it should. The AHCA was driven by a political directive to pass a bill so that Republicans could say they made good on a campaign promise, with little regard for how people would be affected. The Congressional Budget Office’s estimate that 24 million Americans would lose their health insurance within a decade was twisted into an avowal that once people were freed from the shackles of government interference, they would have the ability to choose a plan that worked for them and their health care needs. Trump’s statement on Friday that the best thing for the Republicans politically would be to let Obamacare “explode” indicates his lack of interest in the actual lives of people who are affected by what the government, of which he is now in charge, does and does not do. 4. There are still plenty of ways for Trump and his administration to weaken the Affordable Care Act. They could rewrite regulations to undo some of the act’s provisions, including no-cost contraceptive coverage and the cost-sharing subsidies that help people pay for co-pays and deductibles; both of these were added to the ACA by rule and are not written into the law itself. Or they could undermine the exchanges by pulling funding for advertisements in advance of the open enrollment periods, which could lead to fewer people signing up. 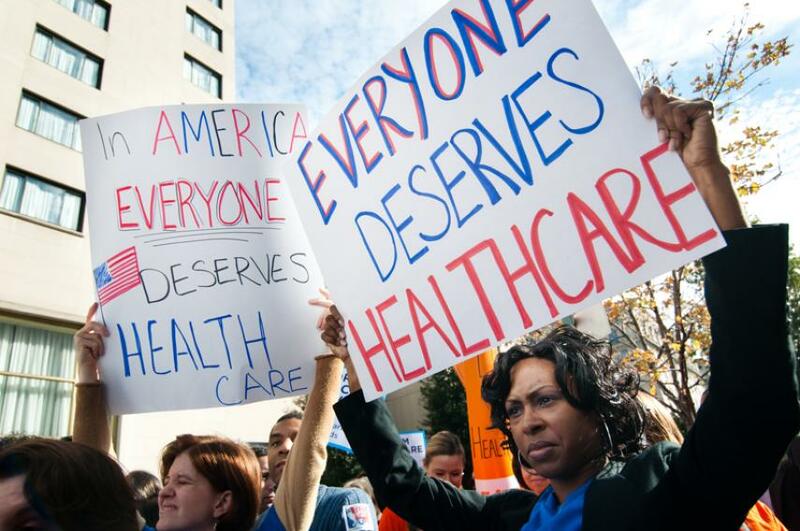 In short, the Affordable Care Act may be safe for now, but this is just the beginning. And whether the law is weakened or strengthened through the tweaks that are sure to come may depend on continued public pressure to expose the ways in which the law is working, as well as the ways in which it can be improved.